I don’t normally devote blog posts to book recommendations, but I have one for you today. It’s not a book on spiritual or personal development, however. It has nothing to do with Busting Loose, the tools, Truth, Consciousness, or The Teachings I normally discuss. But it has important content regardless … from a more “mainstream” or “earthbound” perspective. 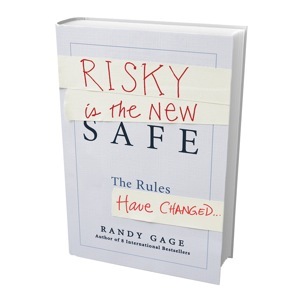 It was written by my friend Randy Gage and is called Risky Is The New Safe. “I divide learning into 2 categories: Direct Learning and Collision Learning. Direct learning is when someone says ‘X’ to you and ‘X’ is valuable. Collision Learning is when someone says ‘X’ to you, ‘X’ makes you think of ‘Y’ and ‘Y’ is valuable to you. This is a different kind of book for a different kind of thinking. It’s a thought-provoking manifesto for risk takers. Disruptive technology, accelerating speed of change, and economic upheaval are sweeping through what I call “Story Space.” The old ways of thinking and doing things don’t work like they once did. There’s an opportunity for something new and Randy offers some fascinating and compelling suggestions. Like me, Randy is a renegade who dares to fly in the face of “the same-old-same-old” with aggressiveness and force, so be prepared for that! Be sure to Like, Tweet and/or share this post however you can. And I’d love to hear your comments below if you do get a copy of the book!